Humans have colonised many planets and on one, Aeran, something strange has happened. The colonists have de-evolved into a stone age culture. Elspeth Mueller has come to find out why. Her colleague warned against the madness the planet evokes if you stay too long so she keeps her trips to the surface short. Until the empire, in the form of shipMeister Gorstein, arrives and Elspeth is trapped. Elspeth is conscious of losing her grip on her memories as the days go by. She begins to understand what is happening on the planet with the help of Peter Ashka, a seer, who is troubled by the effect that Aeran has on his relationship with his oracle. In Holdstock’s universe there is a uniting force that can give guidance in the form of oracles such as the I-Ching, an indication of what will happen if no action is taken, if one continues on the current path. It is understood that people can change their fate if they choose to act. If the prediction does not come about, it is because something changed or the interpretation was flawed. Aeran has its own oracle, the Earthwind, that is never wrong and the Aerani believe their fate cannot be changed. At first, Elspeth and Peter attribute this to the primitive nature of the Aerani culture but eventually come to believe that there is a fundamental difference between the two oracles. Gorstein wants the Aerani to accept a mind-implant that will connect them to the other worlds because the empire is paranoid about rebellion. Elspeth opposes this for two reasons: the threat the empire poses to the Aerani culture, and because of the possibility that what has happened on Aeran might spread to other planets via the implant. The colonists themselves are divided and the debate ruptures the community. The longer Gorstein’s ship stays on Aeran the greater the risk they will all revert to stone age mentalities. 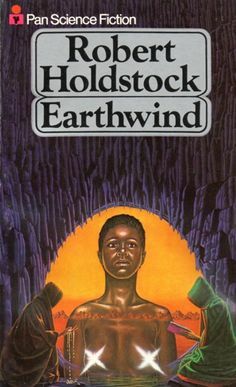 Elspeth must seek the source of the Earthwind to discover what is happening to her. It was nice to have a female protagonist of colour, especially as there was no reason for the character to be either of those things. It was just a choice, and it was refreshing that the author made it. I found this both thought-provoking and entertaining. It’s a good adventure story, with a mystery solved by Peter and Elspeth but not without cost. I think this one will stick with me for a while.